I blogged about my garlic planting template several years ago. I also wrote about it in my book, The Complete Guide To Making Great Garlic Powder, and The Planet Whizbang Idea Book For Gardeners. But I think it's such a great idea that I'm mentioning it here again. 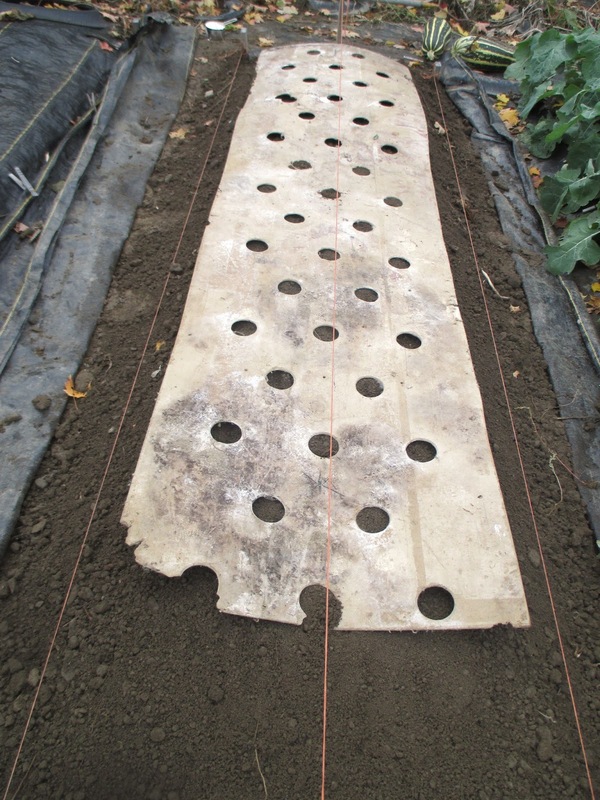 The template pictured above is one I made when I was planting a LOT of garlic (in my neighbor's field) as a homestead business. It is made out of Masonite and I keep it stored under my workshop. It is worse for wear, but still does it's job very well. The bed is now planted. I will leave it uncovered until it gets a few fall rains and the soil settles down. Then, before the really cold weather comes, I'll cover it with thin a black plastic mulch and some loose straw. The garlic cloves will first develop some roots, then they will send up pointed shoots. Ideally, the roots will form and the shoots will not emerge, or barely emerge, before the winter snows come and growth stops. Then, early in the spring the shoots will emerge. Based on my observations from last spring, I believe the shoots will pierce their way through the thin black plastic next spring. This will save me from trying to make a hole in the plastic for every garlic plant, as I've done in the past. If they do not spear their way through, I will be able to see them under the plastic and will make a hole for them as needed at that time. The template looks like a great idea! I find that it's easy to "lose my place" when planting garlic. I may try to create something like that to use in the future (this years garlic is already planted). I immediately cover the bed with a layer of straw, but now I'm wondering if it would be best to leave it uncovered until after a rain. I'm not sold on the plastic idea (although the weed-free bed looks enticing), but straw helps with the weeds, even though some years I get a lot of wheat seedlings coming up with the garlic, and that is a pain. I bought your gardening and garlic books. This year will be my first experience with planting garlic and I'm going to plant two varieties...about 40-45 cloves, with the intent to save enough to expand my planting next year, and hopefully again, the year after that. For the template, I followed your guide but made it 2' x 2' for a couple of reasons: first, my "starter" bed isn't eight feet long, and, secondly, just to make it a little easier to store and carry and move myself. I figured it would be easy enough to just move and align as I go. I'm planting next week so we'll see how it works! I also made mine out of the thin plywood made for underlayment and gave it a coat of tung oil. 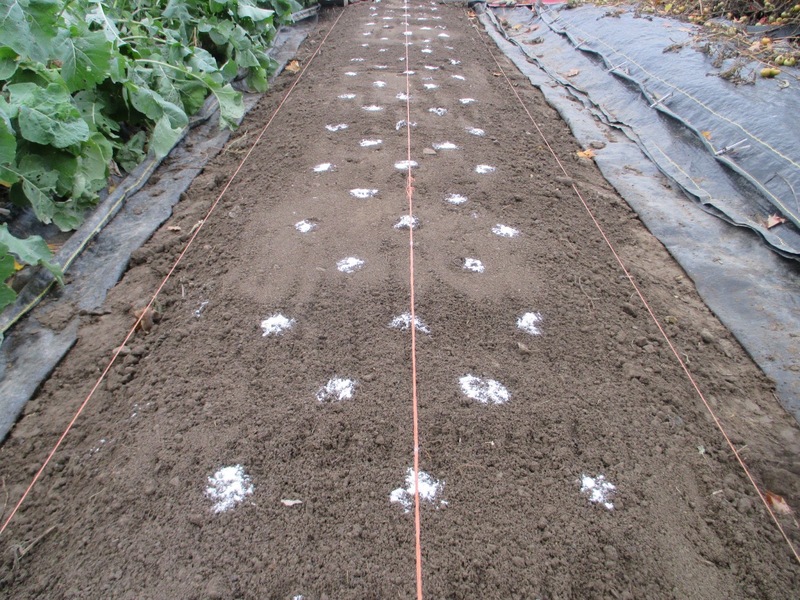 Have you ever tried just planting as you go, rather than marking with flour and having to go back? Thanks for all the great ideas and inspiration. I really enjoy reading your blog. There is no reason why the planting template can't be shorter. It actually makes good sense because the long template is awkward for one person to pick up an move (windy days make it more awkward). And, as you say, storage would be easier. If my long template ever degrades to an unusable state (it's laying on the ground under my shop when not in use) I'll make a shorter one. Planting as you go makes sense too. Just put a clove in the center of each hole and plant it after you move the template. I like that! your comment is an example of good ideas being improved on, which is what I write about in the Introduction to the Garden Idea book. Thanks for the comment. I totally love all of your blogs posts, they are so interesting and informative. Hoping one day to really read and study some of your gardening practices. I do have a couple questions: do you garden organically and what was your reasoning behind switching to the plastic. I don't mind why if you have already addressed that question, if you will link to you post. Thanks, and God Bless all your efforts. That said, in my "Planet Whizbang Idea Book For Gardeners" I explain a couple of logical disconnects in the organic dogma, as espoused for decades by Rodale press and their organic advocacy. That isn't to criticize the organic movement in any way— only to say that nutrient density (nutritional value) of food does not come from an absence of chemical pesticides, and compost alone is not the universal answer to proper fertilization. I wish it was. Does the garlic get enough water through the holes or do you add water drip lines under the plastic? I never water my garlic beds. 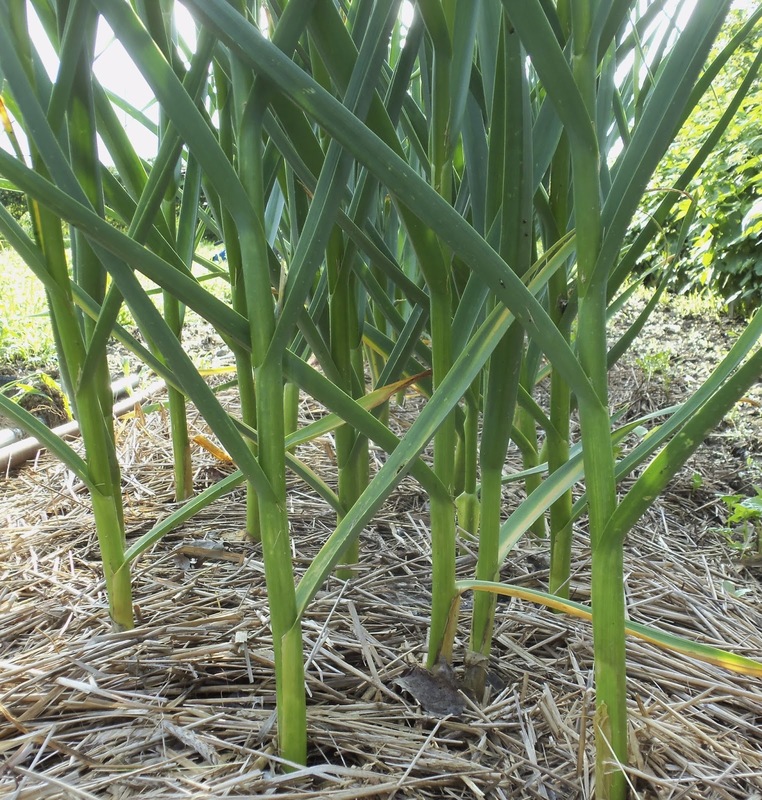 The clove spacing in the bed is far enough apart that subsoil capillary action is sufficient to supply the water needs of the growing garlic. The soil is always moist under the plastic. If I were to plant with close spacing (as many people do in garden beds) capillary soil moisture would not be enough and some sort of artificial watering would be necessary. Also, this is central NY state and we do not have a dry climate, like some southern climes. Which is to say, this method works well for me here. It might not work the same elsewhere. Good question.